JB Priestly said that ‘so much of England is just around the corner’ and it is true of Hastings and St Leonards. If you can bear to leave the promenade and explore ‘just around the corner’, you will discover some remarkable pubs and some good walks. 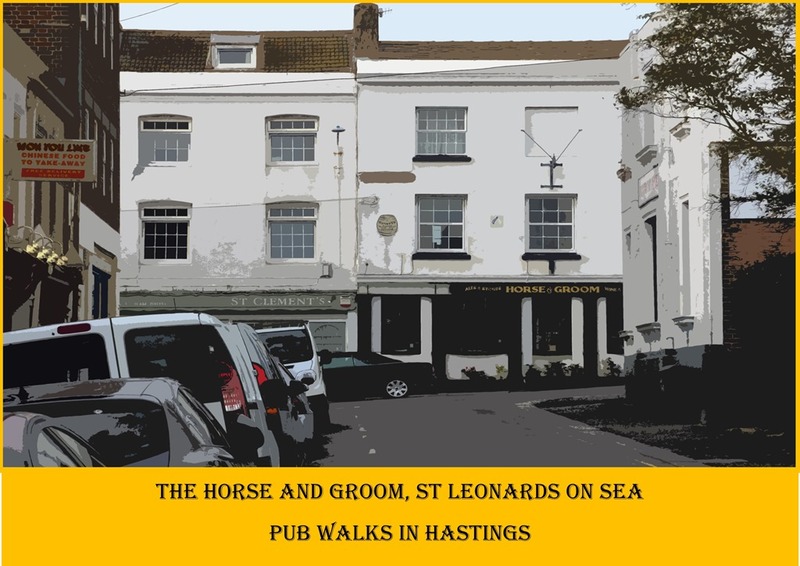 Try a pint in either the Horse and Groom or the St Leonard on Walk 3 of Pub Walks in Hastings and St Leonards and you will not be disappointed. Posh St Leonards, still full of Victorian and Edwardian grandeur. Those dreams that occupied the rich and famous have been largely replaced by a more pragmatic approach to urban living. The big houses still command Burton St Leonards but many have been converted to flats. The little terraced cottages, that housed the tradesmen and the washerwomen, now possess a chic that is more appealing and far more affordable. ‘The Horse and Groom was St Leonards’ first pub. It was built and licensed in 1829 for the benefit of the workforce busy constructing the new town of St Leonards. Thirsty workers/walkers still visit The Horse and Groom. Warm and friendly, the two rooms are separated by a horseshoe bar and a back room for larger groups. The beers, Harvey’s Best and one or two guests, are always good and you get the feeling of a proper pub with no taped music, no food (just cobs on the bar, if you are lucky) and eclectic decoration. A quiet, atmospheric, dog friendly pub where you can enjoy good conversation and when I visited, the guests were Young’s Winterwarmer, Longman Long Blade and a fine Green King Abbot that slipped down a treat. The St Leonard is the latest, refurbished and reinvented in 2012 with its wooden floors, mismatched tables and chairs, local art work and three regularly changing guest beers. Quality bar snacks are available and pizzas can be delivered to your table. I was impressed with the Franklyn’s St Leonard, Franklyn’s Greedy Guvnor as well as the Hogsback T.E.A. Opening hours are restricted to evenings (Wednesday to Saturday) and Sundays so it may be one to note in that black beers stained notebook to return to later. 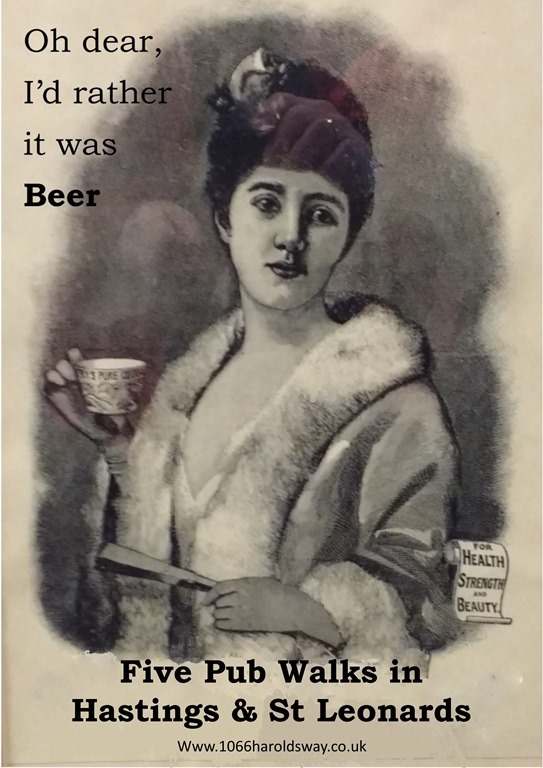 The Nags Head, first opened as a beer house around 1835 it was licenced in 1853. One claim to fame is that Robert Tressell drank there in the early 20th century before writing the ‘Ragged Trousered Philanthropists’. It is a ‘no frills pub’ with darts and bar billiards, pickled eggs and Young’s Bitter, Courage Best and Hobgoblin to try. The beer garden at the back is one of the best in town. Five urban trails, all within walking distance of Hastings and St Leonards on Sea.